Vancouver, Canada – Mawson Resources Limited (“Mawson”) or (the “Company”) (TSX:MAW) (Frankfurt:MXR) (PINKSHEETS: MWSNF) announces promising electromagnetic survey results from the South Palokas prospect and updates winter 2019 drill plans at the Company’s 100% owned gold-cobalt Rajapalot project in northern Finland. The Company announced a maiden gold-cobalt resource for the Rajapalot project on December 17 2018, which was comprised of the Raja and Palokas prospects. South Palokas is one of two bodies that made up the Palokas resource estimate and at the time measured 180 metres of strike, depth of 220 metres and widths of up to 20 metres. The South Palokas and Raja conductive bodies, along with other extensions to gold-cobalt resources, will be tested by a drill program scheduled to commence in late January 2019 (subject to final permitting). A 15,000 metre, five drill rig program is proposed, with contracts in place with three drilling companies. Approximately 70 people will be employed to execute the program once work commences. Mr. Hudson, Chairman and CEO, states, "Electromagnetic geophysical surveys have defined an undrilled conductive body, extending more than 200 metres down-plunge from high grade gold intersections at South Palokas. Similar success was achieved with TEM at Raja, where a conductive body was discovered for 550 metres below the resource. Geophysical surveying is ongoing at Rajapalot, in preparation for an exciting 15,000 metre winter drill campaign focused on resource expansion, scheduled to start in January 2019 (subject to final permits). A recently completed TEM geophysical survey has confirmed and further defined earlier helicopter-borne VTEMplus electromagnetic surveys and outlined a strongly conductive body immediately down plunge from the South Palokas gold-cobalt resource. At the upper margin, this conductive zone encompasses PAL0016, the deepest drill hole at South Palokas, which intersected 8.4 m @ 5.7 g/t AuEq (“gold equivalent”), 4.9 g/t gold, 471 ppm cobalt from 206 metres. Electromagnetic techniques were first used in 2013 by Mawson at Rajapalot with a helicopter-borne VTEMplus survey indicating the conductive nature of areas subsequently discovered to be the Palokas, South Palokas, The Hut, Terry’s Hammer, Rumajärvi and Raja gold-cobalt prospects. 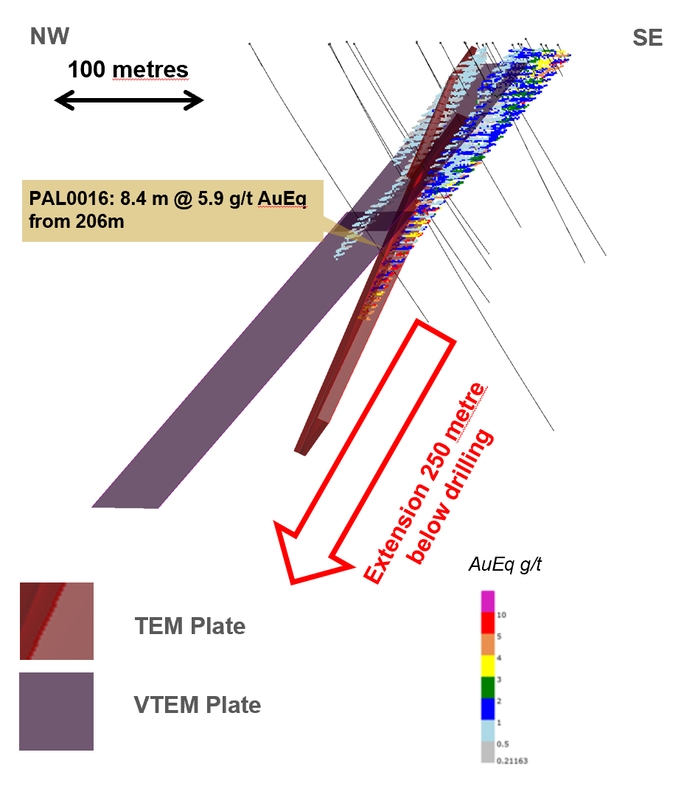 The broad scale of the line spacing (100 metres) and the low current induced in the ground from the VTEMplus survey required follow-up with ground TEM surveys to accurately locate conductors to the accuracy of a drillable target with electromagnetic loops positioned to gain maximum response from inferred locations of mineralization. 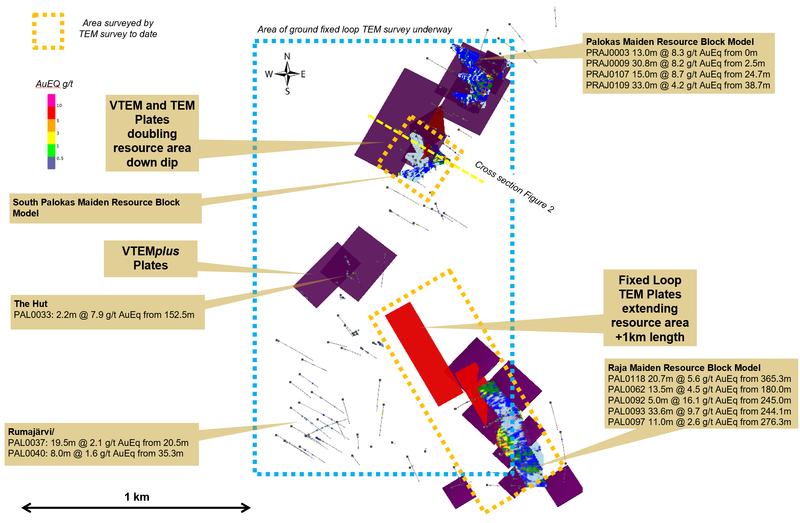 TEM surveys have already more than doubled the 450 metre long Raja prospect to greater than 1 kilometre down plunge. The Raja conductive body corresponds with known mineralization and then continues to at least 1 kilometre down plunge (600 metre vertical depth) with increasing conductivity and remains open. It appears the northern extensions of Raja may coalesce with the Hut prospect VTEM conductor at depth. Subject to final drill permit approvals a five rig, 15,000 metre drill program will commence in late January 2019 at the Raja and South Palokas prospects to target the electromagnetic down-plunge extensions of the resource mineralization. Modelling of fixed loop electromagnetic surveys (TEM) have been instrumental in the planning for the winter drill program. The electromagnetic surveys were conducted by two and three person teams from GeoVista AB (based in Luleå, Sweden). Line orientations for this program were matched with prior survey parameters. Post-collection processing and inversions of the data are completed by Dr Hans Thunehed of GeoVista AB. The gold equivalent (Au Eq) value was calculated using the following formula: Au Eq g/t = Au g/t + (Co_ppm/608) with assumed prices of Co $30/lb; and Au $1,250/oz. Mawson Resources Limitedis an exploration and development company with a focus on the resource expansion of its high-grade Rajapalot gold-cobalt in Finland. Mawson has distinguished itself as a leading Nordic Arctic exploration company. On December 19, 2018, Mawson filed an independent National Instrument 43-101 Technical Report (the “NI 43-101 Technical Report”) on the Mineral Resource Estimate for the Raja and Palokas Prospects, at the 100% owned Rajapalot Project in Finland, (the “NI 43-101 Technical Report”), in support of the Company’s news release dated December 17, 2018. The NI 43-101 Technical Report was authorized by Mr. Rod Webster of AMC Consultants Pty Ltd (“AMC”) of Melbourne, Australia, and Dr. Kurt Simon Forrester of Arn Perspective of Surrey, England. Each of Mr. Webster and Dr. Forrester are independent “qualified persons” as defined by National Instrument 43-101. The NI 43-101 Technical Report may be found on the Company’s website at www.mawsonresources.com or under the Company’s profile on SEDAR at www.sedar.com. The gold equivalent ("AuEq") value was calculated using the following formula: AuEq g/t = Au g/t + (Co ppm/608) with assumed prices of Co $30/lb; and Au $1,250/oz. AuEq varies with Au and Co prices. Figure 1: Plan view of the Rajapalot area showing prospect areas, with mineralized intersections, TEM and VTEM electromagnetic conductive plates and resource block model projected to surface. Figure 2: NW-SE Cross Section looking north, showing TEM and VTEM electromagnetic conductors extending the South Palokas resource 250 metres down dip to double the mineralization footprint.